Californian Annette recently sent me some photos of her completed Bunnies in the Garden Sewing Case. Here is her case closed. 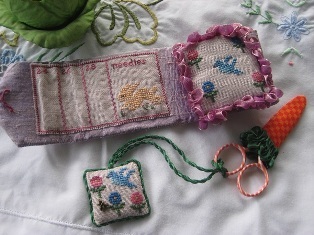 And here it is opened revealing the needlepage and pincushion. Below Annette's sewing case is her scissors weight and carrot-shaped scissors case. Here is an enlargement of Annette's scissors weight. 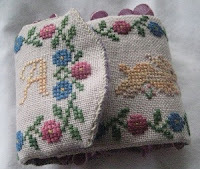 Here is Annette's pincushion embellished with ribbon along the edges. The pincushion is removable. 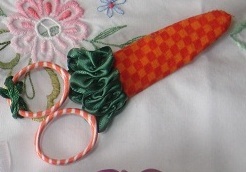 And here is an enlargement of Annette's carrot scissors case. I love the orange fabric she chose. In a note Annette included with her photos, she wrote, I have completed stitching your chart of "Bunnies in the Garden". This was such a joy to stitch. I am so thrilled that I was able to follow your instructions. Your instructions are clear and precise. I made sure that I read and re-read them before the cutting of the needle page. And I did it! WooHoo!!! That was a first for me. If I could stitch all these sewing necessities, anyone can. I learned new techniques from you. I got to learn the Nun's Stitch, how to cut the design out, add a quarter in the scissors fob (never heard of it before, and I love the feel of the weight of it), and I got to learn gathering of the ribbon. And I also got to learn how to make a cord and didn't need any fancy machine to make it. I'm so thrilled. Now I get to enjoy my new sewing set for in time for Spring. I added my intials on the scissors fob. My ribbon was a bit too wide for my pincushion but I still used it becasue I did not have another color ribbon that would work. And I did make the pocket on the needlepage, as per your instructions. I stitched on 32ct Lilac Linen, threads - DMC, Silk Gloriana, WDW, Victorian Motto Sampler Shoppe & Chameleon from The Cherry Tree, South Africa. The bunny and my initial are stitched in the thread from South Africa. The thread was given to me from a friend Lee who lives in New Zealand. So that was very special to me. Can you tell that I truly had FUN stitching your "Bunnies in the Garden"? Yep, I sure did. Annette, I can't begin to tell you how happy it made to read your note. We try very hard to give very detailed assembly instructions, so it makes me very happy to read your glowing comments. You did a terrific job with assembling this project! You must be thrilled. Just think, not only do you have a wonderful springtime sewing case, but you also learned some new techniques in the process. I bet with your new confidence you'll be using the techniques on other projects. The lilac linen is so pretty with this design, and I don't think your ribbon is too large. It gives a luxurious look to the pincushion. I saw Annette's piece on her blog -- it's so wonderful! Yet another project I have tucked away waiting for me. I need to get busy! Annette has made a lovely job of her 'Bunnies' and is obviously thrilled to bits with her achievements, well done. I've had the chart for this project for more years than I dare think about and might just kit it up ready to take on holiday later in the year. What a sweet finish, I love all the finishes, the carrot is adorable. Oh thank you so very much Ellen. I am thrilled and so very pleased with your charts. I sure did learn lots of new techniques from you. I heartfully Thank You. She sure did a fabulous job of it! A Happy, Blessed Easter to you.